When I look at this unique sculpture I have to wonder if there’s a giant ice cream sundae waiting just around the bend! 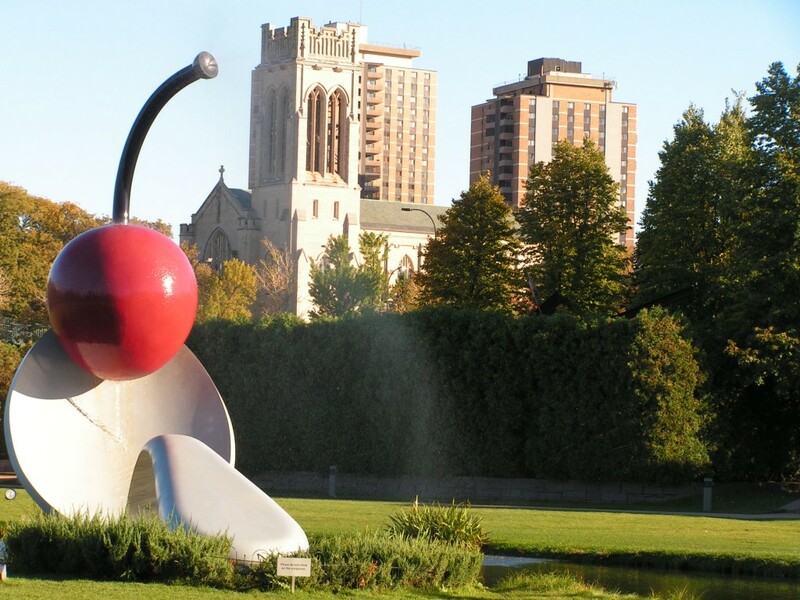 Spoonbridge and Cherry is located in the Minneapolis Sculpture Garden and was created by Claes Oldenburg and his wife and collaborator, Coosje van Bruggen. You can really get a good idea of how big the spoon is when you compare it to the people standing on the other side of the pond! 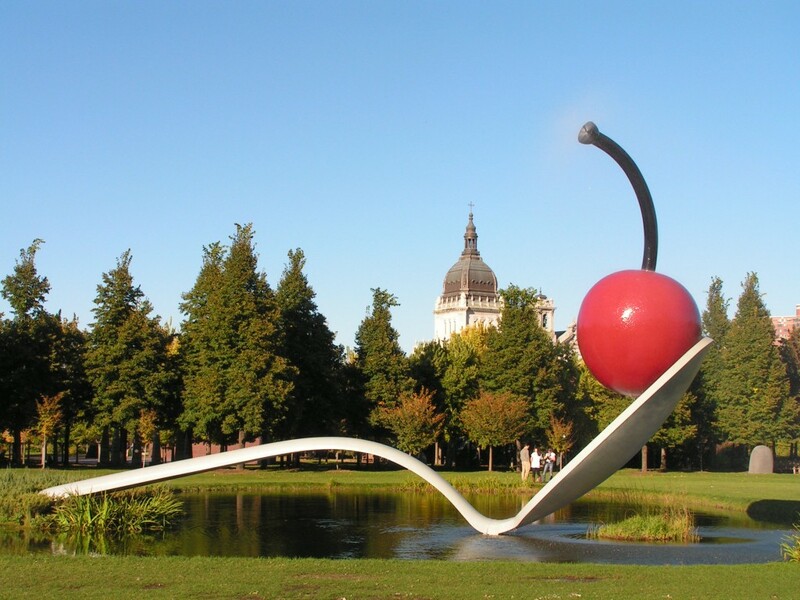 ~The spoon weighs 5,800 pounds and the cherry weighs an amazing 1,200 pounds! Another View! You can clearly see the mist in this picture. Claes has created an amazing array of over-sized sculptures that can be found all over the world—bowling pins, thumb tacks, a baseball bat, and a giant flashlight are just a few. I’d personally like to see the “Dropped Cone”, a 39-foot upside down ice cream cone that’s perched on the top of a building in Cologne, Germany. If you get there before I do, make sure to post your story. I’ll be a bit jealous that you beat me to it, but I really want to see it! This post is dedicated to Debbie. 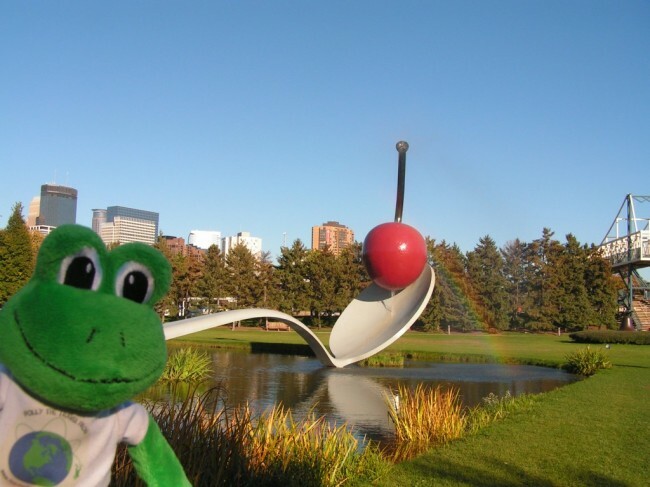 She really wanted to see Spoonbridge and Cherry but wasn’t able to go on the trip with us…I hope you enjoy looking at the pictures! Thanks for the great pictures and information about the bridge. It was almost as good as being there! It would take a really big dish to run away with that spoon! All of a sudden I have the urge to run out and get some Cherry Garcia ice cream. See ya! Wow, this is amazing! I looked up some of the other sculptures that you mentioned and they also look great. I’m not sure that I would want one in my back yard, but they are fun to look at! One of his scupltures looks like a giant Swiss Army knife! Did Polly get on the Spoon? I would if I was Polly. I can lift the statue up. Can polly lift it?